The Targus Car Charger for Laptop & USB Tablet is a 90 watt adapter that allows you to quickly charge a laptop and USB tablet or smartphone at the same time from your car’s electrical socket. • Sized for travel, this charger is than most conventional car power adapters and comes with a 2.1A USB fast charging port that connects with your USB devices charging cable providing the same charging speed as your original charger. 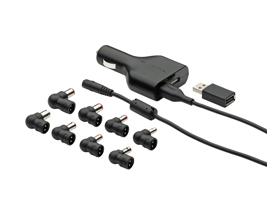 • This reliable adapter includes 8 connector tips to support Acer, Compaq, Dell, HP, IBM, Lenovo, Sony, Ssmsung and Toshiba right out of the box.